Torre del Lago near Lucca hosts a festival dedicated to the famous Italian composer Giacomo Puccini, with a fantastic calendar of classic operas in an equally fantastic setting. The 3,400 seat open-air theatre looks over the picturesque Massaciuccoli Lake and is surrounded by a charming park. 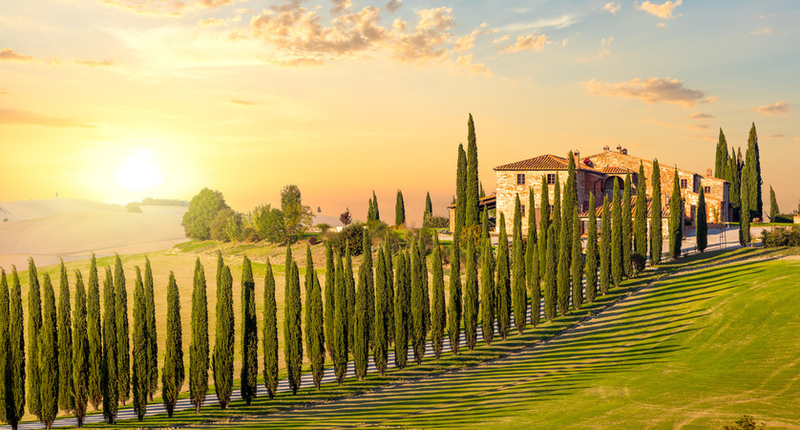 Our Treasures of Tuscany Escorted Tour includes all entrance fees, tours and wine tasting to some the region's highlights with our knowledgeable and friendly tour manager. The Hotel San Luca Palace is an elegant and stylish Renaissance hotel, centrally located in the medieval square of Lucca. The hotel can be found within the city walls, walking distance away from the main sites of Lucca, the shopping district and the train station. The Grand Hotel Francia & Quirinale is one of the most elegant hotels in Montecatini. Well known for its high standards of attentive service and excellent cuisine. The Grand Hotel & La Pace is set in the heart of the bustling town of Montecatini, close to the shops, bars and restaurants. The hotel is also within walking distance of the famous Montecatini thermal spas, making it a perfect base for guests wanting a relaxing holiday. This elegant hotel enjoys a great location close to the heart of Montecatini with all its shops, bars and restaurants and the Tettucio Spa and gardens are also nearby. The Hotel Ilaria & Residenza dell'Alba is located within the medieval walls of Lucca, making it a perfect base for anyone wanting to explore this lovely, historic town. Affiliated to the Leading Small Hotels of the World, the Bagnis di Pisa is a sanctuary of luxury and well-being. The complete wellness and Spa hotel for all your relaxation and pampering needs. Meticlulously restored this 19th century villa has fresco ceilings and incredible artwork throughout and nestled in 45 acres of parkland. The Grotta Giusti, immerses you in Italian luxury. The Grand Hotel Plaza is ideally situated in the centre of Montecatini, overlooking the main square and close to all the main attractions. Superior and charming hotel with stylish decor, dating back to 1900, the hotel offers excellent hospitality in quiet, elegant surroundings. A recently refurbished, prestigious hotel enjoying a quiet location conveniently close to the park and nearby restaurants. 10 minutes’ walk (1km) to the centre of Montecatini. Surrounded by the greenery of the Tettuccio spa gardens, the Astoria enjoys a picturesque and peaceful setting. This small and friendly hotel is the sister to our popular Hotel Astoria and is located close to the thermal park.